Mens water trunks have come a long way. Modern fabrics perform fastidiously to block the sun's rays from your thighs, dry quickly when you exit the water and fit perfectly. 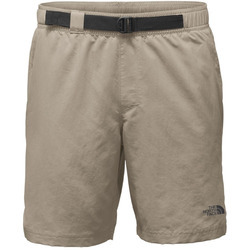 A superior pair of water shorts will allow you to hike comfortably through any terrain to reach that unspotted swimming hole away from the masses. They will have mesh lining or expertly placed seams to prevent chafing during extensive activity. They should fit well enough to prevent sagging when you exit the water. Most also provide thoughtful pockets to store the essentials while you swim or adventure. An exemplary pair of water shorts are a summer essential. Paramount brands include Patagonia and The North Face.